Michael Ende was a German author of books for children and adults. If you can read German, you can learn more about him at his website. 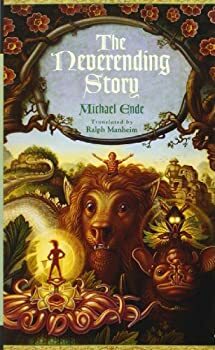 The Neverending Story is probably best known to the general public through Wolfgang Peterson's movie, whereas the original novel by Michael Ende is less well known. Despite the horrid sequels and the even worse television series that Michael Ende desperately tried to prevent in the last years of his life, Wolfgang Peterson's first attempt at bringing the book to the big screen was successful and popular. However, fans of the book will know that it only records the first part of the story — though Peterson compensates by telling us in the final segment of the film "Bastian had many more adventures before finally returning to the ordinary world. But that's another story..."
The Night of Wishes — (1989) Publisher: The sorcerer Beelzebub Preposteror and his witchy aunt must complete their annual quota of evil deeds before midnight. But a small cat and a raven are waiting to foil their plans and save the world. Momo — (1973) Publisher: Momo is very intelligent and is not easily fooled by the two men who come to town telling people to save time and deposit it in the bank. With the help of her friend, Professor Hora, and a turtle, she is determined to find out what they are doing with time.